Are Nutrition Labels an Effective Weapon Against Obesity? You are here: Home / Evidence-Based Living / Are Nutrition Labels an Effective Weapon Against Obesity? Millions of Americans make goals to lose weight every year. Diet books, weight-loss apps, and meal supplements abound. But research shows changing our environments may have a more significant influence on our food choices, and ultimately our health. 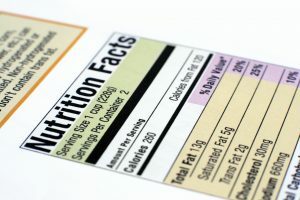 A new systematic review published by the Cochrane Collaboration investigated whether labels that include information about nutritional content help to persuade people to consume healthier foods. Researchers identified a total of 28 studies that compared how people use products with nutritional labels compared with those without a label. Twenty of the studies presented participants with a range of labeled foods on menus or food packages and tracked their choices. The other studies provided participants with only one labeled food or drink option and measured the amount they consumed. Eleven studies assessed the impact of purchasing food or drink options in real-world settings, including vending machines, grocery stores, or restaurants. The most significant finding in the paper: When people ate at restaurants with calories on the menu, they consumed on average 50 calories less in their meal compared to people who ate at restaurants without nutrition labels. Researchers found that other studies in the review used low-quality evidence, so they could not make any conclusions about nutrition labels in vending machines or grocery stores. Another systematic review published by researchers from Australia evaluated the existing evidence on making healthy choices while eating out. Their analysis included 10 separate systematic reviews that looked at how behavioral interventions influence food choices. The review found that social norms had the biggest influence on food choice. In other words, people are likely to make food choices similar to other people around them. That means if your fellow diners are making high-calorie food choices, you are likely to do the same. And if your fellow diners are eating smaller portion sizes, you are likely to do the same. The review also found that portion sizes, as well as the size of dinnerware has a small, but significant, effect on the quantity people eat. Lastly, they found data that health information – such as nutritional labels – are helpful when coupled with additional cues, such as symbols that indicate healthy choices. The take-home message: Your environment does impact your food choices. Listing nutritional information on menus certainly makes a difference. It’s also important to pay attention to how the people around you and your dinnerware impact what and how much you eat.